Take the Xtreme 90-day Challenge with us! Would you like to burn more fat? Would you like to combat stress-related hunger? Would you like to try a Peach Mango or a Pineapple Splash energy infusion drink? “Take the 90 day Challenge with us”!! Get in the best shape you have ever been in!! Lets Drink and Shrink!!! Burning fat couldn’t be any easier!! Get in the best shape you have ever been in! Right now you are one click away from taking the most important step towards having an Xtreme Healthy Lifestyle™ and living a healthier life. Our program is designed to help you reach your goals, no matter how big or small they are. Want to burn a few pounds and “Put the Skinny Back in your Genes”? Getting fit couldn’t be any easier, simply drink an ice cold glass of our delicious SkinnyGenex™ Peach Mango or Pineapple Splash just two times a day. These delicious and energizing natural flavors entice your taste buds, put a big smile on your face, and “Put the Skinny Back in Your Genes”. Xtreme Healthy Lifestyles™ has an extremely simple program, a great support team, and a strong community of people to keep you motivated. Our products have proven results that can be easily incorporated into the busiest lifestyle. Let us help you celebrate your new Xtreme Healthy Lifestyle™. We have made choosing your goals simple as 1-2-3. Pick one of our Challenge Packs, sign up for the Xtreme Healthy Lifestyle™ 90-day Challenge, and get in the best shape ever. Have fun sharing your success with others and be rewarded by entering to win the Vacation of Your Dreams. Xtreme Healthy Lifestyles™ 90-Day Challenge starts every month and there will be a Challenge Winner every 90 days. We will pick a man, woman, and a couple for the Challenge Winners. How it works: if you started in January, your Challenge runs January, February, March and the Winners will be picked in April. If you start in February your Challenge runs February, March, April and the Winners would be picked in May. So everyone gets a chance to have 90 days to get in the best shape ever and win prizes and trips. Pick one of the Challenge Packs. Want to Get in Shape and have more energy? Then Start Your 90 Day Challenge with SkinnyGenex™ Peach Mango and Pineapple Splash. These two delicious beverages are formulated to naturally activate your metabolism and help maintain energy throughout the day to support your weight management goals and sustain your body’s natural healthy energy. Treat your taste buds to a refreshing, delicious, tropical tasting cold beverage. Would you love to start your day with a delicious tasting cup of coffee? 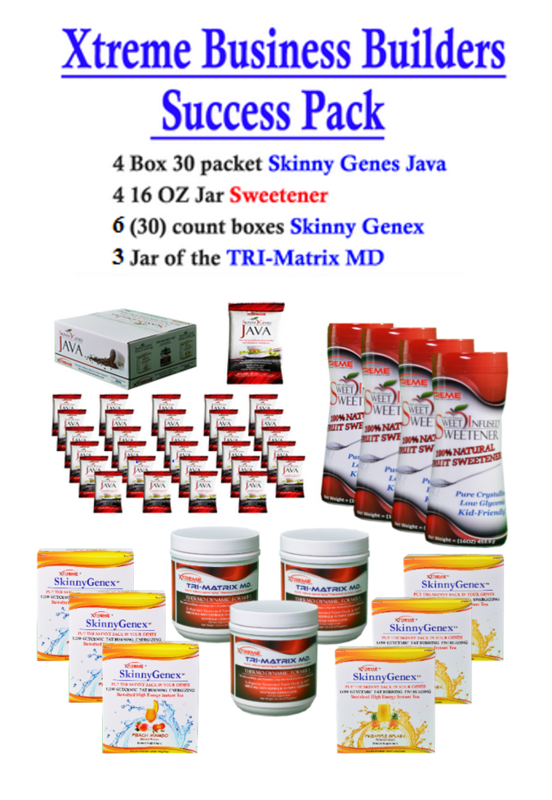 Then start You’re 90 Day Challenge with Skinny Genes Java™. The World’s Only Scientifically Smart Coffee that is Infrared roasted with the finest AA Arabica beans available. Transport your taste buds to the lush and exotic landscapes around the world with every cup of Skinny Genes Java™ brewed from to the convenience of your coffee maker. 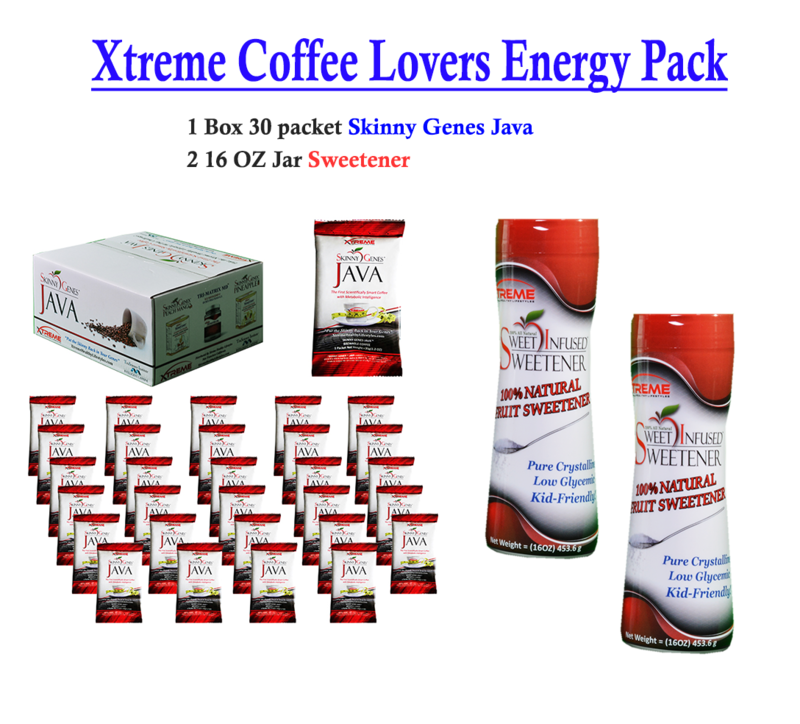 For those that enjoy coffee with a little sweetness, The Xtreme Coffee Lovers Energy Pack™ also includes the 100% Natural Low Glycemic Sweetener, perfect guilt -free companion to Skinny Genes Java™ This pack will put a big smile on your face, and “Put the Skinny Back in Your Genes™”. Are you determined to up your game and increase your level of fitness? The Xtreme Fitness Pack™ is designed with you in mind. This pack not only contains SkinnyGenex™ Peach Mango and Pineapple Splash to support your weight management goals and sustain your body’s naturally, healthy energy throughout the day, but also includes Tri-Matrix MD™, a Sports Performance enhancing Raspberry Fusion beverage that will give you the added boost you need to tackle an active lifestyle. Just drink it 30 minutes before your workout or exerting activity and you’ll put the pep back in your step! Want to Start your 90 Day Challenge with a delicious tasting cup of Skinny Genes Java™ to get going in the morning, but prefer a nice refreshing cold beverage to push through the afternoon energy gap? The Xtreme Action Pack™ provides you with the variety you need throughout your day to stay on track. Start your day with the deep flavor, rich tasting, delicious Skinny Genes Java™ that is Infrared roasted with the finest AA Arabica beans available. Then Turbo Charge your afternoon with our SkinnyGenex™ Peach Mango and Pineapple Splash beverages that are formulated to naturally activate your metabolism and help maintain energy throughout the day. 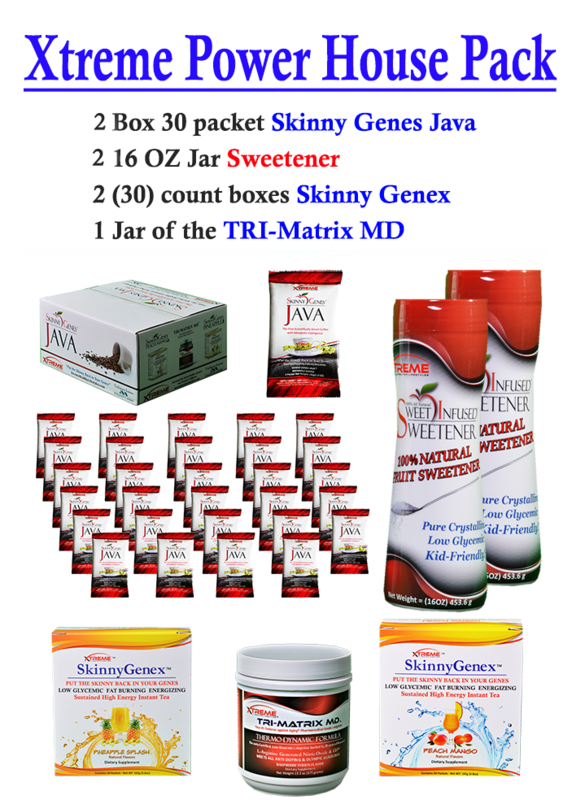 For those that enjoy their coffee with a little sweetness, also included is the 100% Natural Low Glycemic Sweetener, the perfect guilt-free companion to Skinny Genes Java™. By selecting The Power House Pack to launch Your 90 Day Challenge, you are ready to be a force to be reckoned with. Kick all excuses to the curb and take back your body for good! 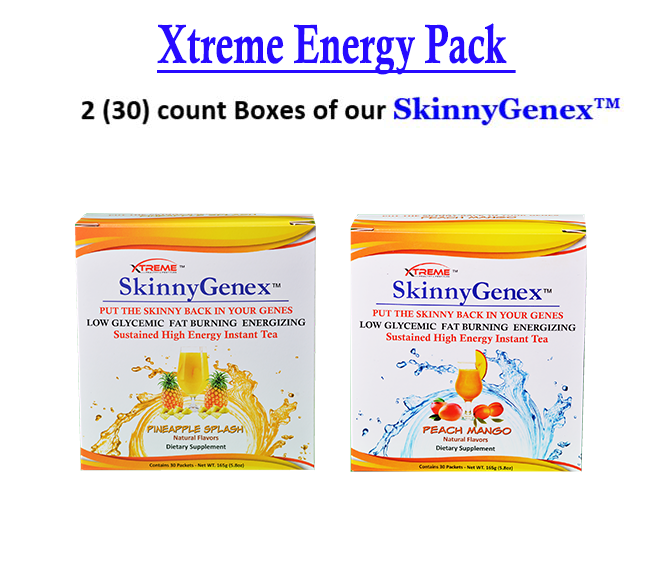 This pack is designed to give you the complete line of Xtreme Healthy Lifestyles™ products to put the power of a healthy lifestyle back in your hands. The Power House Pack includes the deep flavor, rich tasting, delicious Skinny Genes Java™ that is Infrared roasted with the finest AA Arabica beans available. And, for those that enjoy their coffee with a little sweetness, included is the 100% Natural Low Glycemic Sweetener, the perfect guilt-free companion to Skinny Genes Java™. To further Super Charge your day this pack includes SkinnyGenex™ Peach Mango and Pineapple Splash beverages that are formulated to naturally activate your metabolism and help maintain energy throughout the day. Completing The Power House Pack™ are two jars of Tri-Matrix MD™, a Sports Performance enhancing Raspberry Fusion beverage. Take both as directed throughout the day and also follow the night time regimen of Tri-Matrix MD™ and enjoy your body as it delivers natural, peak, healthy performance and a fast recovery time! Want To build a big business… This is for the serious builder that wants to be able to take all the products and have product on hand to drive a large organization. Those that Get Fit Together, Succeed Together! What better way to Start Your 90 Day Challenge by motivating yourself than to get healthy with your crew! Call some of your close friends to Join the Challenge with you and build an Xtreme 90-day Challenge Team of Champions. Whether it’s your spouse, partner, best friends, or neighbors, having others to share in your incredible journey is a great motivator! The Xtreme Team Elite Pack™ is perfect for the group that wants to launch their Xtreme Healthy Lifestyle™ Together. 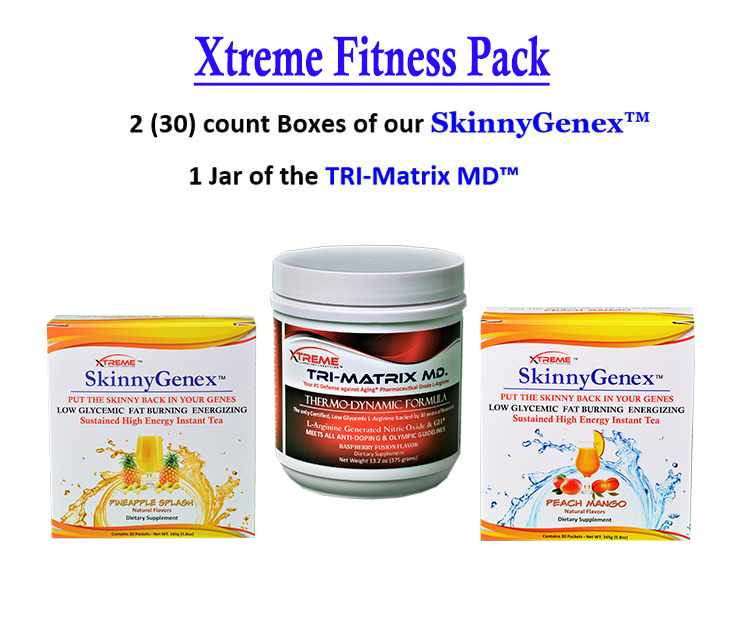 This Xtreme Team Elite Pack™ will have your crew living a Low Glycemic Lifestyle immediately. 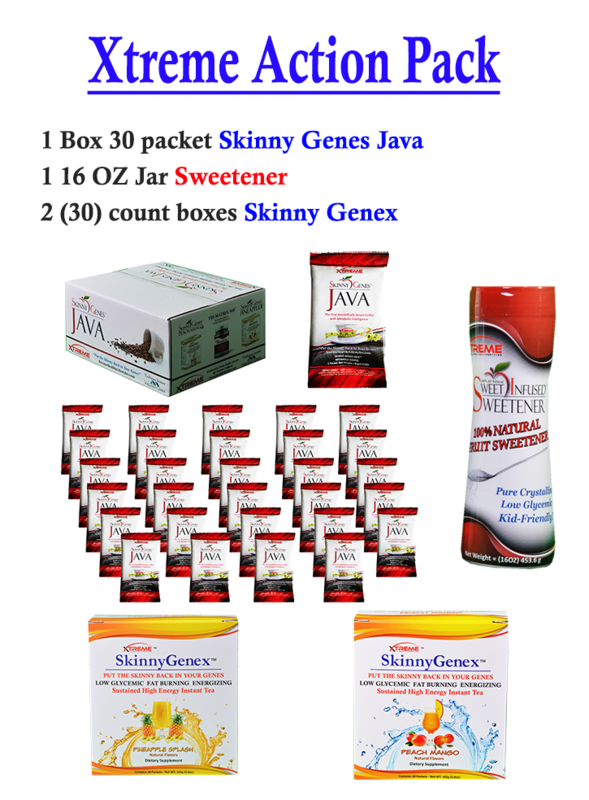 This Pack includes our deep flavor, rich tasting delicious Skinny Genes Java™ that is Infrared roasted with the finest AA Arabica beans available, and for those that like their coffee with a little sweetness, the 100% Natural Low Glycemic Sweetener, the perfect companion for your Skinny Genes Java™ is also included. For an added Turbo Charge to your day, included are SkinnyGenex™ Peach Mango and Pineapple Splash beverages that are formulated to naturally activate your metabolism and help maintain energy throughout the day. Completing The Xtreme Team Elite Pack™ are two jars of our Tri-Matrix MD™, a Sports Performance enhancing Raspberry Fusion beverage. Take these two as directed throughout the day and follow the day and night time regimen for Tri-Matrix MD™ and enjoy your body as it delivers natural, peak, healthy performance and a fast recovery time!